King George II of Great Britain - (November 10, 1683 - October 25, 1760). Sophia Dorothea, later Queen consort of Prussia - (March 26, 1683 - June 28, 1757. George divorced Sophia in 1694 for committing adultery with Count von Konigsmarck. He had her imprisoned in the Castle of Ahlden, where she remained until her death in 1726. Their daughter, Sophia Dorothea, would be the mother of King Frederick II of Prussia, known as Frederick the Great. George's mother died only a few weeks before her cousin, Queen Anne I of Great Britain, and thus it was George who inherited the throne on Queen Anne's death on August 1, 1714. The Hanoverian ruling family were the closest Protestant relatives, but they faced opposition from supporters of the Stuart pretender. 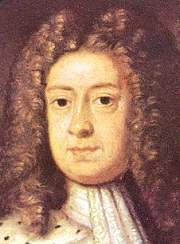 An unsuccessful rebellion took place in 1715, in an attempt to put James Francis Edward Stuart, the son of King James II of England on the throne. See Jacobitism. George never learned to speak English properly, and divided his time between Britain and his other territory of Hanover. He had a poor relationship with his own son, George, who was created Prince of Wales shortly after arriving in Britain. The birth of a second grandson in 1717 was the occasion for a family quarrel, and the Prince of Wales was banished from the royal residence along with his wife and children. Some reconciliation was eventually achieved, but they were never on cordial terms. George I died at Osnabrück in 1727 from a stroke while on his way to Hanover, where he was buried. His son succeeded him as King George II of Great Britain. George's remains were shifted to the Schloss Herrenhausen after World War II.